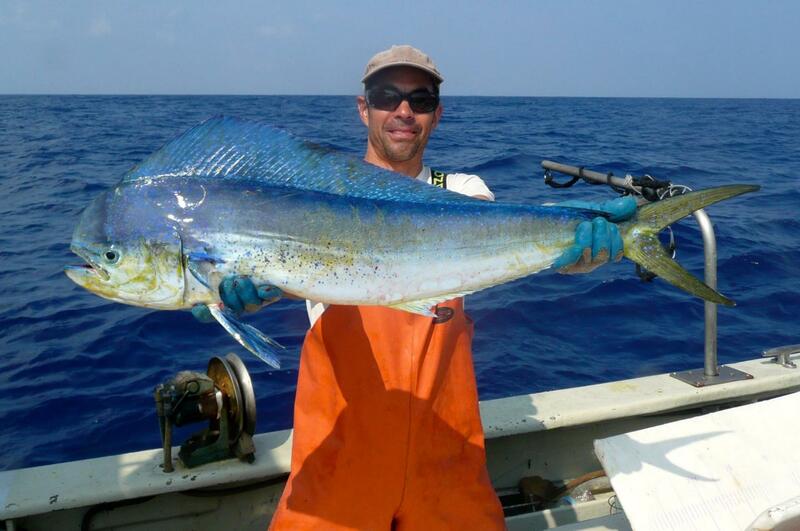 Assistant professor Kevin Weng of the Virginia Institute of Marine Science with a dolphinfish or mahi-mahi (Coryphaena hippurus) collected as part of the study of Fukushima-derived radioactivity in large Pacific Ocean predators. Credit: A. Gray aboard FV Aoshibi IV. When the Fukushima power plant released large quantities of radioactive materials into nearby coastal waters following Japan’s massive 2011 earthquake and tsunami, it raised concerns as to whether eating contaminated seafood might impair human health—not just locally but across the Pacific. A new study by an international research team shows that those concerns can now be laid to rest, at least for consumption of meat from migratory marine predators such as tuna, swordfish, and sharks. The team focused on cesium, a silvery metal with a large number of radioactive isotopes. Two of these, 134Cs and 137Cs, form when uranium fuel breaks down in nuclear reactors. The cesium isotopes are of particular concern because they were discharged in large quantities following the disaster, exhibit relatively long half-lives (2.1 and 30 years respectively), and tend to accumulate in the muscle tissues that people like to eat. However, the team’s sampling of tissues from predatory fishes and other large vertebrates collected across the northern Pacific between 2012 and 2015 revealed no detectable levels of 134Cs, and 137Cs concentrations that were generally consistent with background levels from aboveground nuclear testing during the 1940s and 50s. They collected the animals from waters near Japan, Hawaii, and California. 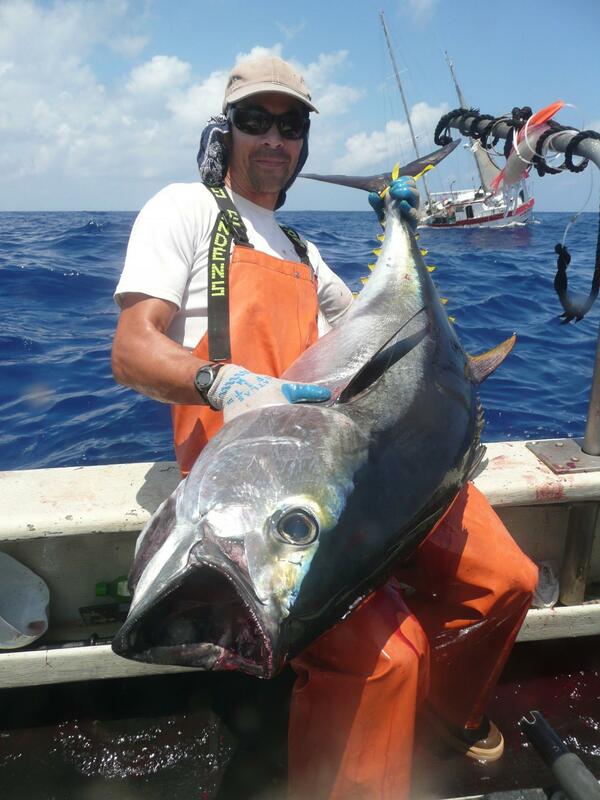 Assistant professor Kevin Weng of the Virginia Institute of Marine Science with a bigeye tuna (Thunnus obesus) collected as part of the study of Fukushima-derived radioactivity in large Pacific Ocean predators. Credit: A. Gray aboard FV Aoshibi IV. Also contributing to the study were Zofia Baumann and Nicholas Fisher of Stony Brook University; Owyn Snodgrass, Heidi Dewar, and Peter Dutton of NOAA’s Southwest Fisheries Science Center; Michelle Berman-Kowalewski of the Channel Islands Cetacean Research Unit; and Jun Nishikawa of Tokai University. Although this early work focused on the utility of cesium isotopes as a happenchance tool that could help scientists characterize migratory patterns among a group of heavily exploited commercial fishes, public attention focused on perceived risks to human health. “The earlier studies showed extremely low risks from cesium to anyone eating these migratory species, but public concern persisted,” says Weng. That concern also expanded to include not only the species of tuna in which cesium had been measured, but to other fishes, marine mammals, and sharks.